Half time bike polo at the roller derby. 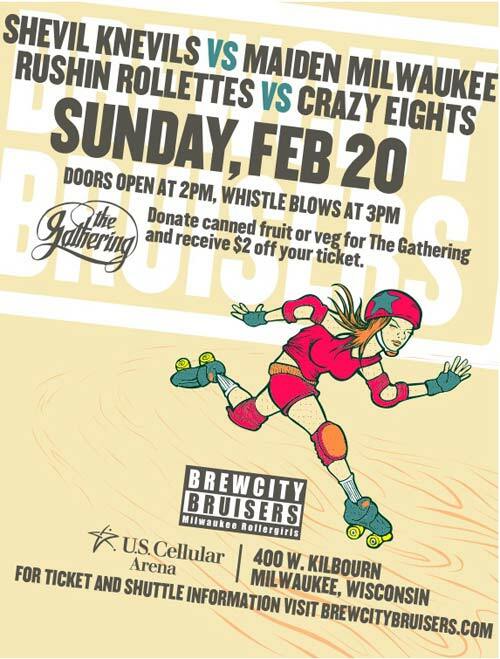 Looking at the MKE Bike Polo blog I see they are set up to play bike polo for their local roller derby in a half time show. 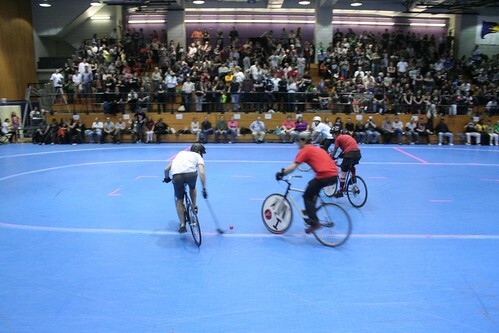 Again NYC Bike Polo will be doing a half time bike polo match. 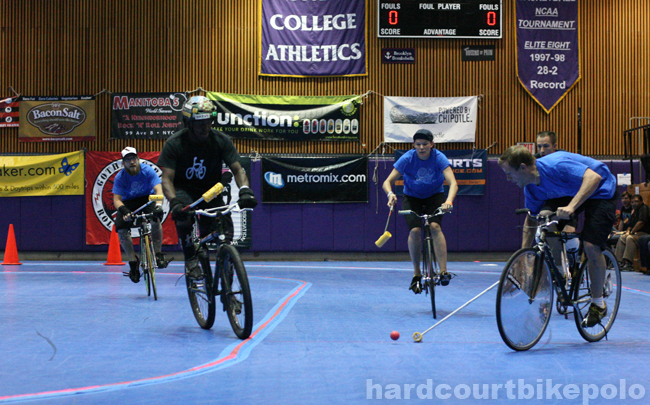 In bike polo there are two general forms of play, pick-up and tournament games. In pick-up the teams and the players on the teams change at the end of every game, the people waiting to play get a turn and some of those who just played wait to play again. The games are not exceptionally important, everyone waiting to play will get more games in, there are no prizes, there is no scoreboard (other than calling out the score). 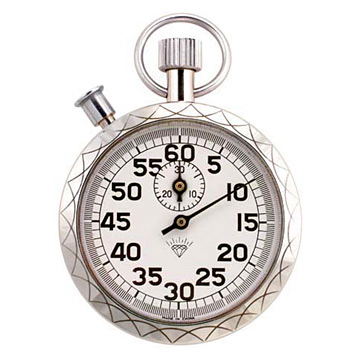 And there is no set allotted time, at least not if the game ends before the crowd gets too impatient. In pick-up, games are played first to 5 points wins. 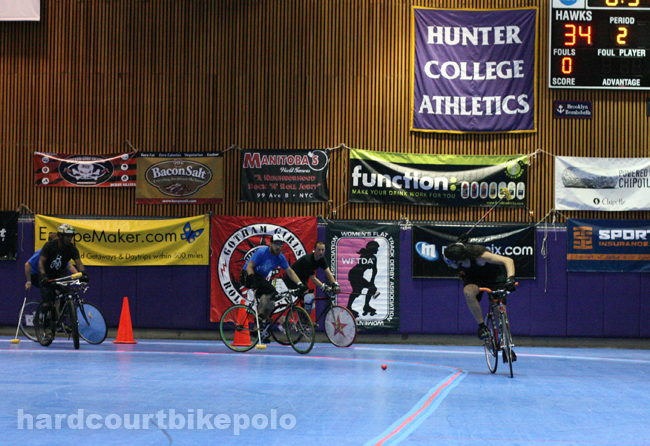 In bike polo tournaments the games are played first to 5 points wins. I think this has carried over from the majority of games being played as pick-up and never really making the move to a more legitimate time structure. But if one were to think about this in relation to nearly all other sports, our method seems out of the ordinary. Lets take polo for example. In polo the matches are played in chukkas and the score has no impact on the length of the game. Same goes for traditional grass bike polo, soccer, hockey, basketball, football and the list goes on. 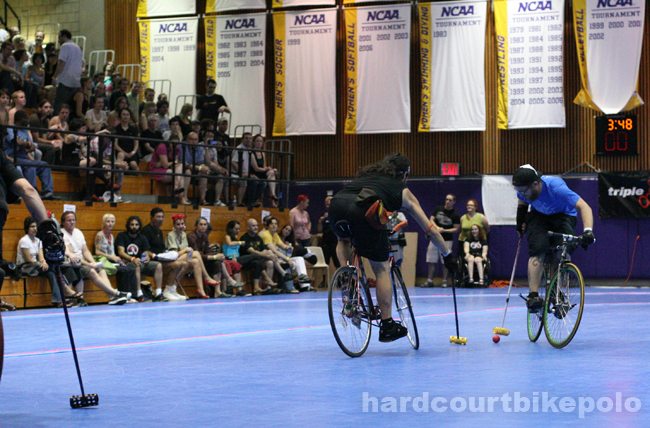 Even in roller derby, a sport that hardcourt bike polo has a lot to learn from, they compete for two 30 min periods. 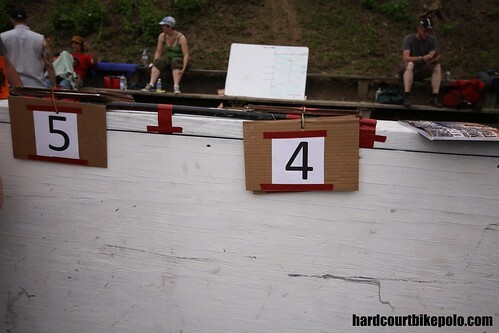 The other day Adam put forth the format he purposed to be used at this years East Side Polo Invite 5 in NYC. A noteworthy change is that all games will end at time (that will vary depending on the round) and the widely accepted “first-to-five wins” rule is being abandoned. I think this is a good thing. It’s an absolutely necessary change that will, eventually, have to come into effect. I’m going to end this short but there are many points to make. And I hope Adam does not mind that I post this quote from a club email. Bike Polo, originally uploaded by Hope.. 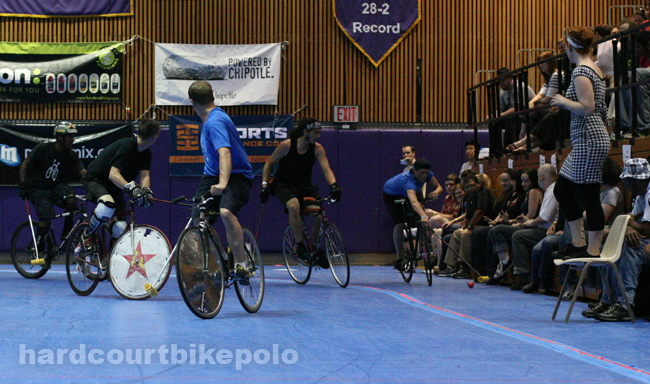 Here is a shot of us playing bike polo during the half time at the Gotham Girls Roller Derby. Follow the link to a few more. Look at all those people in the stands. x2. First in real time, then in hyper time. In the green room of Hunter College as we were waiting to play bike polo as the half-time show for the Gotham Girls Roller Derby. We played a 10 min. game in front of about 800 people. 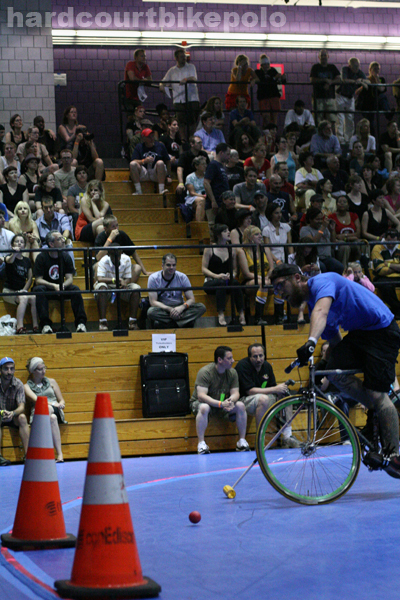 Gotham Girls Roller Derby has invited NYC Bike Polo back for another display of 3 on 3 bike crashing as a half time show. I think I should be recovered enough to play this time. Last time I just took pictures. It should be really good, about 1000 people watching and it is going to be Adam’s official bow out of bike polo. GGRD’s Queens and Brooklyn teams take turns competing against the Sockit Wenches of Seattle’s Rat City Rollergirls in an East vs. West double-header showdown. This faceoff takes place at the Hunter College Sportsplex, at the southwest corner of Lexington Ave and 68th Street in Manhattan, directly at the 68th street stop on the (6) subway line and near the (F) train stop at 63rd street. The Hunter College Sportsplex is wheelchair-accessible; for specific questions about access, leave a message at the Gotham Girls hotline: (888) 830-2253. General Admission: $19.75 in advance, $23 at the door. Don’t be disappointed at the door – get tickets now! call Brown Paper Tickets directly at 800-838-3006. Show your borough pride and cheer for your home teams. HOT TIP — skaters love fan-made signs! This bout will also feature a between-bout Costume Contest sponsored by Halloween Adventure. Afterparty at Manitoba’s – 99 Avenue B, between 6th and 7th street. Gotham Girls Roller Derby invited NYC Bike Polo to play a game of bike polo during the half time show for the match of The Brooklyn Bombshells versus The Queens of Pain. Zach, Grace and Ken played as a team up against Corey, Chombo and Adam. Blue Vs. Black same as the main event. 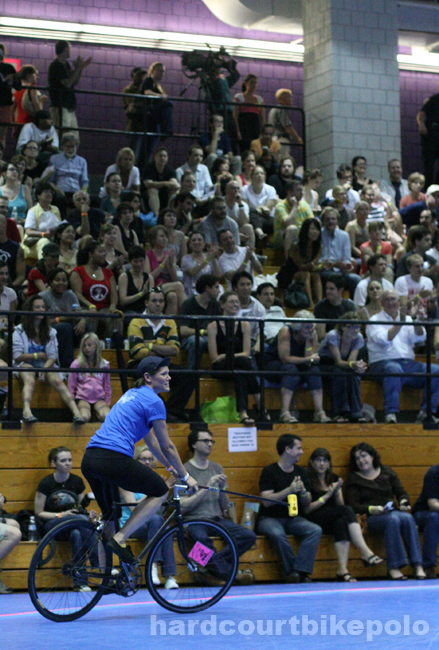 The exhibition game of bike polo was more than likely played before a record number of spectators, an estimated 1,000 people watched as the loud buzzer marked the start of the game and the roller derby announcer gave the play by play. The single match was about 12 min. long and the final score was unrecorded. But the crowd loved it, cheering and booing. It was awesome. I got a few shots but my indoor photography is not so good. 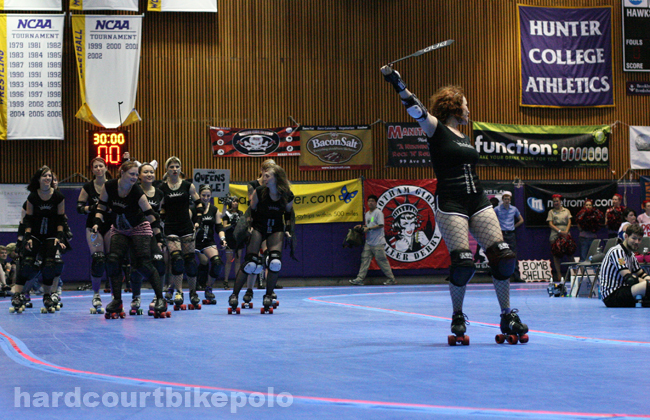 And roller derby is really crazy to watch. There are some fast and tough skaters out there. Before the half time Queens was stomping on Brooklyn, but after the half, Brooklyn was not down and out. The last half was a true battle and Queens was pressed to keep the lead, even thought the lead was only brought back to something like a 25 point gap. 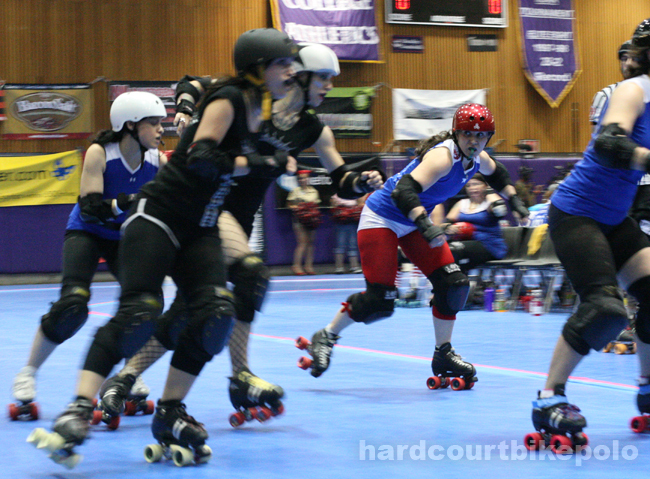 Every second of this flat-track all girl roller derby was keeping me on the edge of my front row seat.